Senator Charles Schumer (D-NY) is pushing a plan to end an unemployement tax surcharge. 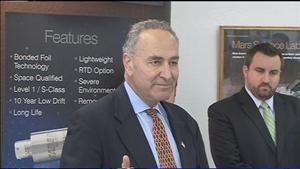 The Niagara USA Chamber was proud to stand in attendance with Senator Charles Schumer when he came to Niagara County to announce a new bill he has introduced. The Senator appeared at Taber Industries in North Tonawanda to introduce his bill that would stop the unfair burden passed on to business owners in the form of a surcharge to recover New Yorks $95 million debt related to its borrowing of $3 billion from the Federal Unemployment Trust Fund, part of the American Recovery and Reinvestment Act which ended earlier this year. Since Congress has failed to extend interest-free loans to state governments to cover their incurred costs, those costs have been passed on to business owners in the form of a $20 surcharge per employee, known as the unemployment insurance surcharge. In the case of Taber Industries, this would cost them around $2000 per year. Schumer has stated that his bill has bipartisan support, and is confident that it will pass. If it does pass it would extend the loans interest free through 2012 and any company that has had to pay the surcharge would receive compensation retroactively.